“What matters is how many Nigerians have been or can be expeditiously enrolled under the NIMS; how many Nigerians hold or can have their e-ID card and how soon or when, how many Nigerians can benefit from the ‘proof of identity’ services, a component of the NIMS Infrastructure. How safe, unique, accessible to other MDAs and the private sector, is the National Identity Database and the multiple applications on the e-ID card“. AT last, the long wait is over. On August 28, 2014, the Nigerian National Electronic Identity Card (e-ID Card) was unveiled and the card issuance process formally kicked off. The aim is to issue and manage over 120 million e-ID cards within the next five to 10 years. That’s the NIMC dream, and it’s possible! This effort started in 2005 with the constitution of a committee on the Harmonisation of Identification Schemes in Nigeria by the then President Olusegun Obasanjo. Nasri el-Rufai, former FCT minister, chaired the committee. On March 22, 2006, the Federal Executive Council (FEC) approved what later came to be known as the National Identity Management System (NIMS). This was followed by the formal launch of the National Policy and Institutional Framework for a National Identity Management System in Nigeria – one document most critics seem never to have read or ignored. When on May 25, 2007, the NIMC Act was signed into law, the journey seemed well founded or so it seemed. Those of us who joined the NIMS Project just before then had no idea what lay ahead. We now know better. Suffice it to state that the e-ID card is remarkably different from the one issued under the scheme that was implemented between 2001 and 2006 by SAGEM, (now Safran Morpho), the French company that was contracted in 2001 to do it. Whilst the e-ID card is based on smart card technology, the previous one was based on (2D) Bar Code technology. The e-ID card is part of an infrastructure for identity management. So it is not an ‘end in itself’. Most card schemes in Nigeria today are just that – issue and manage the cards. So the card is the end/objective. Identity management is not the same as card issuance management. The e-ID card, the third in a five-component National Identity Management System (NIMS) Infrastructure remains what most Nigerians (want to) see as the index of success of the project. Indeed there are those who, for good reason, believe that the National Identity Management Commission (NIMC) represents another bogus effort by government at addressing a simple problem, claiming that there is nothing ‘reformatory’ in the statutory mandate of the NIMC (Act 23 of 2007). That is not important. As one critic put it recently, it is not the number of enrolment centres or the level of automation of the registration process or the quantity of hardware and software assembled and or deployed that matters. It is not about the conducive enrolment environment or the fact that you can go and register at your convenience, within minutes and at a known location. No, these things do not matter at all, otherwise there would not still be new biometric projects springing up each day! Even the private sector partners of NIMC are quick to criticise the NIMC effort to justify their promotion of new and or similar and competing projects (that are subsequently contracted to them). What a paradox! What matters is how many Nigerians have been or can be expeditiously enrolled under the NIMS; how many Nigerians hold or can have their e-ID card and how soon or when, how many Nigerians can benefit from the ‘proof of identity’ services, a component of the NIMS Infrastructure. How safe, unique, accessible to other MDAs and the private sector, is the National Identity Database and the multiple applications on the e-ID card. Indeed, how soon can the Law Enforcement Agencies (LEAs) begin to use the NIMS to fight crime and insecurity? Can we sustain the NIMS? How will NIMS stop the proliferation of data capture activities and meet the identity authentication and verification needs of MDAs and the private sector? These are some of the indices of success that should matter. Government has demonstrated its determination to resolve this major social infrastructure gap. Fortunately, initial studies by the NIMC provided enough empirical evidence for some of the strategic decisions and policy options adopted in the deployment of the NIMS. Unfortunately, however, the private sector has not responded appropriately to the project. Whilst bidding for the concession in 2006/7, they documented their proposal strongly including evidence of financial capability. Then we had the financial meltdown of 2006-2009. Although the Concession was signed in July 2010, it has not been possible to achieve financial closure but for the intervention of NIMC, based on the Public -Private Policy of government, this project would have become comatose. The journey to the e-ID card launch was long and difficult. Many not only doubted, they questioned the rationale even in the face of evidence on global trends. Most dissenting views and voices seemed founded strongly on old habits and ways of doing things. The message was somehow clear: NIMC must get it right or be damned. Five important points to note: This may well be a greenfield people are unwilling to admit. Second, most critics understood the problem of identity card issuance very well but not the problem of Identity Management. So they never really understood and or came to terms with the NIMS project. Consequently, they did not ask the right questions nor probed deeper, they compared ‘oranges with apples’. They never even bothered to visit the NIMC. Third, the old habit of ‘pull it down’ syndrome never really gave way. Fourth, the private sector seemed unprepared for the role and business model it signed up on. Finally the deep public cynicism carried over from past efforts was and perhaps still persists. The e-ID card is a multiple applications card. The design, approved by FEC in November 2012 was to ensure anti-tampering and counterfeiting. It is made of 100 per cent polycarbonate with a customised eighty kilobyte (80kb) chip. There are 13 applets including the Match on Card (MoC), electronic identity (e-ID), electronic public key infrastructure (e-PKI), an ICAO applet and a payment applet. There are applets also for voters register, health insurance, insurance policy, tax, pension, drivers licence, SIM register, transport and an extra applet for immediate deployment as necessary. The Malaysian card has more applets! The personalisation of the cards requires special skills and equipment in a high security area typical of Bank ATM Cards except that the card profile for personalisation combines two worlds, the EMV/ATM world and the e-ID world. This is another point where the global trend is captured. Electronic identity is now being used as a deep anchor for electronic payments and the e-ID/payment nexus provides a ready KYC infrastructure which fosters financial inclusion and deepens the electronic payment circuit as identity theft-related fraud is shut out immediately whilst providing a ready infrastructure for ‘bringing everyone, including the informal sector into the formal financial services sector. The activation of the Euromoney/Visa/MasterCard Automated Teller Machine (EMV/ATM) ‘world’ in partnership with MasterCard has drawn significant criticisms even from those who allege that they introduced MasterCard to the NIMS project. Interesting! Again, five points to note: First the MasterCard was not awarded the contract for the production of the national e-ID card. Second, there is no risk to our national security whatsoever. The National Identity Database that contains our biometric data is not open to anyone. Fact is only some of an individual’s demographic data is made available to a wholly Nigerian company for the purpose of preparing the ‘virtual account data’ (pre-paid) that is used to activate the EMV solution on the chip during card activation. At best all parties to the ATM solution on the card have access to only transaction data – digits and numerals that are associated with transactions on the ‘virtual account’! Not too long ago a former President of the Nigerian Computer Society held a press conference to condemn government for allegedly awarding a contract for the production of the e-ID cards to MasterCard. I expect more of such unprofessional comments, now that the card has been launched. Ironically, in spite of such criticisms, some companies have been awarded contracts by some state governments to implement exactly what is being condemned – with MasterCard! So the question for another day is what has changed? What is most tragic is the level of misrepresentation of facts, trying to mislead the public in the face of laudable government efforts. The much-talked about national security concern is because there is not enough understanding of the way the card is designed. I have only made a brief reference to it above to preserve the security and integrity of the system and the card. To those who are quick to illustrate their reservations with the experience in Russia lately, please take your time to reflect on the fact that branded payment solutions like MasterCard does, in fact, operate in Russia and South Africa for pensioners, and now being developed for UAE and the U.S., to mention just a few. It’s the global trend. The ‘MasterCard-national security’ concern is a fallacy considering the fact that MasterCard operates in 210 countries including Russia and recently in Mexico and South Africa where the payment solution is used for targeted strata of the population. If foreigners dismiss this innovation with a wave of the hand and mindset as in John 1: 46, (can anything good come out of Nazareth), must we as Nigerians if it works for us? Like Albert Einstein put it years ago, “We cannot solve our problems with the same thinking we used when we created them”! But there is a difference between an ATM card and a National Identity Card with multiple functionalities including payment functionality. What has national pride got to do with this? A lot, I guess, but we are the first to make this one work! As Appadorai put it in his book, “Substance of Politics”, ‘for forms of government, let fools contend, whatever is best administered is best’. Very few people have bothered to ask why NIMC adopted the ‘e-ID/Payment nexus’ for the card and with so much security features! Why was a Nigeria payment platform not used? How did MasterCard and not another payment platform get selected? What if I do not want it? Several questions. It’s very simple. By the way, until recently there were no foreign payment solutions operating locally in Nigeria. And only one brand held sway, remember? In any case for close to three years the ‘local payment platforms’ slept over their opportunity, I guess, because the scheme was not viable and therefore it was not profitable for them. They did very little to exploit the economic opportunities. The ‘e-ID’ and the ‘EMV’ sides of the card are separately governed and managed. Except where necessary, all rules governing the ATM cards govern the ‘ATM side’ of this e-ID card. The additional benefits of unique identification, nay KYC, are then served simultaneously by the e-ID on the same card! When you are invited to collect your e-ID card, you will have to activate the ‘e-ID side, using your biometrics and then ‘ATM’ side using a PIN number. They are separate processes. So if you do not want the ATM side, you do not activate it, simple! The MasterCard logo appearing on the e-ID card is conventional practice, it’s the norm in the electronics payments sector and it’s used for ‘introducing’ or identifying the card as a payment card to a merchant location. 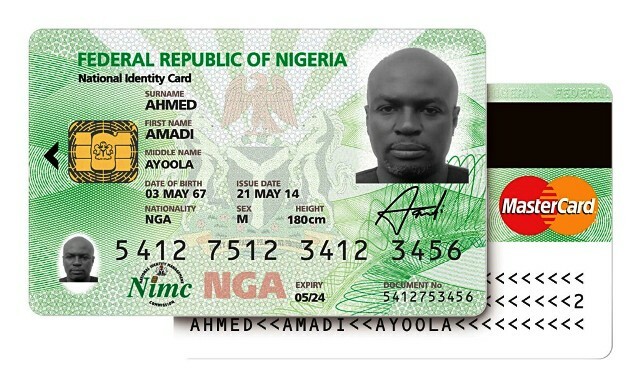 NIMC, in fact, chose to put the logo at the back to ensure that the primacy of the card as an e-ID card is not in doubt because of the payment functionality. At the risk of sounding immodest and being grossly misunderstood, NIMC should be commended and encouraged for being resourceful and thinking through a process for ensuring the sustainability and a deeper role for the e-ID card. The NIMC effort represents an attempt at leapfrogging the e-ID/Payment nexus, which is the global trend, supportive of cashless economy, electronic payment industry, financial inclusion, improving the business environment, deepening consumer credit and freeing up resources for better optimisation in the economy. It is an antidote for the ever-increasing cost of doing business, difficulty in accessing credits, bank customer acquisition, proliferation of photo IDs and the dearth of a reliable identity authentication and verification infrastructure and a host of others. Call it an audacious government strategy if you like, for confronting the problem of identity-theft-related fraudulent practices, stimulating consumer demand and local production, growth in GDP, general economic well-being and security of life and property! That’s what transformation is made of. What NIMC needs is not the barrage of attacks but support to sustain the NIMS through its ‘take-off’ phase, how to get the system to operate successfully in areas where serious infrastructure gaps remain a challenge, how to sustain the multiple-layered security infrastructure with a dedicated, well-motivated loyal, requisite personnel with integrity. One more thing: a genuine private sector commitment to take over its own side of the project currently being managed by the NIMC. Onyemenam is the director general of National Identity Management Commission.